JOIN THE LATEST ADDITION TO GOLF & SOCCER! FOOTGOLF IS PLAYED ON A GOLF COURSE, WITH A SIZE 5 SOCCER BALL AND 21 INCH CUPS, USING NORMAL GOLF RULES. 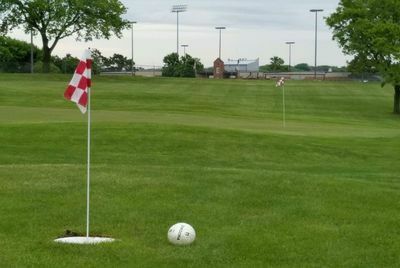 FootGolf is available Wednesdays and Sundays from noon to 7 PM, or other times for groups of 20 or more (June - August). Bring your own size 5 soccer ball, or rentals are available for $3.00 (with a $2.00) deposit. PLEASE NOTE THAT NO CLEATS ARE ALLOWED, AND KICKING OR RUNNING ON THE GOLF GREENS IS STRICTLY PROHIBITED.